I am sorry for everything here. These people need help, yet what they get is the most conceited country in the world telling them that they are nothing and that they are stupid, that they have no idea how to live... We don't even care when we hear each other talk about running their children down in the dirt streets with our armored trucks... We make fun of them in front of their faces, and laugh at them for not understanding we are insulting them [...] I am sorry for everything. The horror that is america is disgusting. There are a few more boxes coming to you guys. Feel free to open them, and use them. Bowe's father, Bob Bergdahl, responded to his son's final message not long after he received it. Dear Bowe, In matters of life and death, and especially at war, it is never safe to ignore ones' conscience. Ethics demands obedience to our conscience. It is best to also have a systematic oral defense of what our conscience demands. Stand with like minded men when possible. dad. 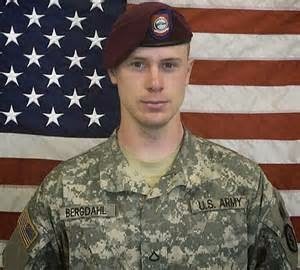 The US Army is now preparing to prosecute Bowe Bergdahl for desertion and other alleged crimes. It is likely they want to put him away as an example of what happens to anyone who risks following his conscience and refuses to go along with the show. Catholic Worker activist Art Laffin shared this photo from Washington. 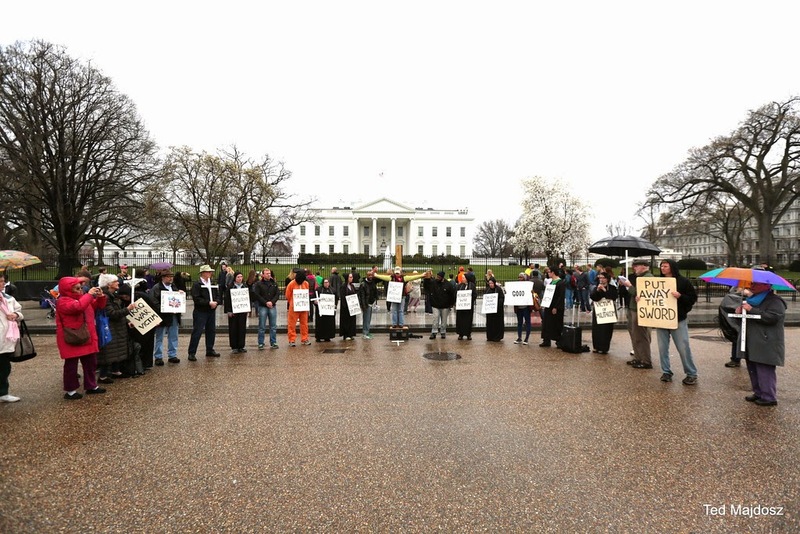 The annual Holy Week Faith and Resistance Retreat was held in the nation's capital and protests followed at the White House (above) and the Pentagon where seven were arrested for their Good Friday Witness against endless war. Imagine being arrested by the military forces of the so-called 'Christian nation' for trying to spread the message of the Prince of Peace. The message of Christ has been distorted from love, peace, justice and sharing to 'a personal relationship with Christ' which fits in well with the 'every dog for themself' culture that capitalism has infested so many people with. So yes let's all pray for the resurrection of the human spirit and a new consciousness of connection to one another and to nature....we need it badly. 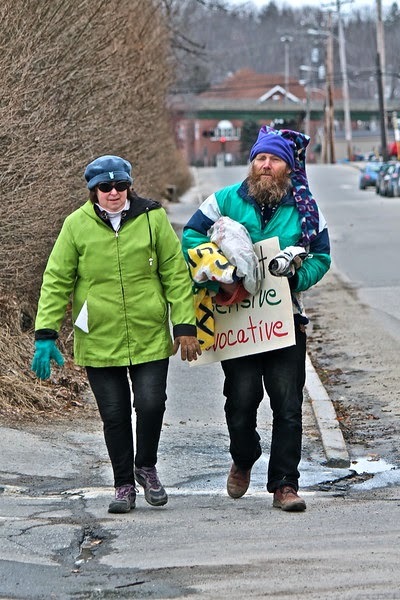 We had our final Lenten peace vigil at Bath Iron Works today. One of our regulars, an elder woman and lifelong peacenik, expressed her deep sadness and frustration to me that she would not likely see peace in her lifetime. I didn't know what to say to her....there wasn't much I could say in that moment. I stood with my sign (a commuter rail system pictured on it with the words 'Made in Bath') facing the gate as workers lined up to leave the shipyard at noon. They were a captive audience. No one yelled anything but some of the younger guys were buzzing and laughing with each other as they uncomfortably made fun of us. In those moments I thought of all the people I was standing there on behalf of.... the people on Jeju Island where these warships will be ported; the people in Ukraine who now have a civil war because of the US-NATO sponsored coup d'état while destroyers made here are presently being deployed into the Black Sea as a threat to Russia; the people of Iraq who were attacked in 2003 by the missiles fired from these warships; and the list goes on. I respect people who go to church. I respect anyone who believes in the Prince of Peace and tries to follow the example of the non-violent Jesus. I was raised to honor Jesus who I believe was a trouble maker and an organizer on behalf of the outcasts, the unwanted, the discarded from society. Sadly I see few Christians, and few of their churches, really sticking their necks out to truly follow the path of their savior. I've heard far too many stories over the years of good peace people being asked to leave their local church because their witness for peace made the congregation and the pastor uncomfortable. The healthy tension they brought into the church ultimately hurt the collection plate - and that was the first priority of their church. America is much like Disneyland where appearance trumps reality. Too many people go to church because of the fancy building, or the business contacts, or the pressure to belong or follow the crowd. I honor those struggling Christians who are trying to be real and wish to carry on the life of Jesus. May Easter bring them new strength and courage to carry the cross of love, joy, justice and real peace. Put the War on Trial! Bowe Bergdahl faces the possibility of life in prison after allegations that he deserted his location and engaged in “misbehavior before the enemy.” However, Bergdahl’s lawyer and legal team are arguing that he had actually been in the process of reporting misconduct. Ben Swann speaks with Gerry Condon, president of Veterans for Peace, to discuss Bergdahl’s actions. As the tentative framework agreement between Iran and world powers over the country’s nuclear capabilities has been set out, new questions about the future relationship between Iran and the rest of the world are emerging. Ben Swann talks to Jamal Abdi of the National Iranian American Council about the next steps for Iran and the rest of the Middle East. Nick Mottern of KnowDrones has created a video about Drones which he is planning to air on TV stations around the country. Since the drones are all operated from Air National Guard Bases around the country, this is a good way to reach the operators and the communities they are operated out of with information about what drone strikes really accomplish. Will the Fragile Nuclear Deal Survive? It was good to hear the announcement yesterday that a framework for a deal with Iran had been made. Immediately we heard Israel complaining about the agreement with Netanyahu saying it would lead to the destruction of Israel. Not a surprising comment from Tel Aviv considering Israel does not really want any kind of a peaceful settlement with Tehran. 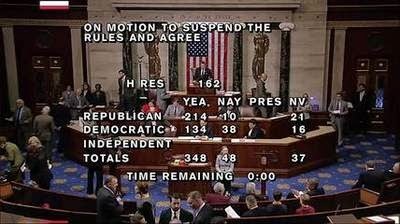 Right-wing Republicans in Congress immediately denounced the deal while several weak-kneed Democrats remained “cautiously optimistic”. Two pieces of legislation Republicans are trying to push through the Senate - the Kirk-Menendez sanctions bill (S. 269) and the Corker-Menendez bill (S. 615) would impose procedural hurdles in the way of a deal - will likely be considered shortly after Congress returns to DC on April 14. Republicans can’t torpedo the Iran deal without help from Democrats. In order to secure a veto-proof majority, Republicans in the Senate need to recruit at least 13 Democrats to support their anti-diplomacy bills. Both sides made major concessions, though it appears Iran’s are far greater. Tehran accepted that U.S. and EU sanctions will not be lifted until after the UN’s watchdog agency verifies that Iran has fully implemented its new nuclear obligations — which could be years down the line. It agreed to severe cuts in its nuclear infrastructure, including the reduction of its current 19,000 centrifuges for enriching uranium to just over 6,000. 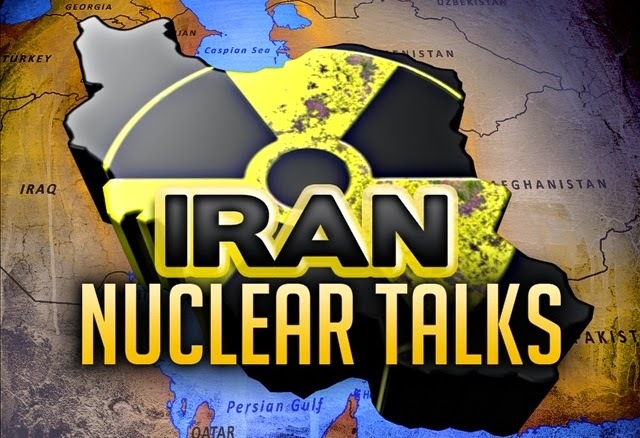 Tehran also consented to rebuild its heavy water reactor at Arak so that it will have no reprocessing capacity and thus cannot produce plutonium. Its spent fuel will be exported. The Fordow nuclear plant, moreover, will be turned into a technology research center without fissile material. And crucially, the UN’s International Atomic Energy Agency will be allowed to conduct unannounced inspections. Long ago I read that Iran wanted to build a civilian nuclear energy program because they are so reliant on sales of their oil and natural gas to run their economy. 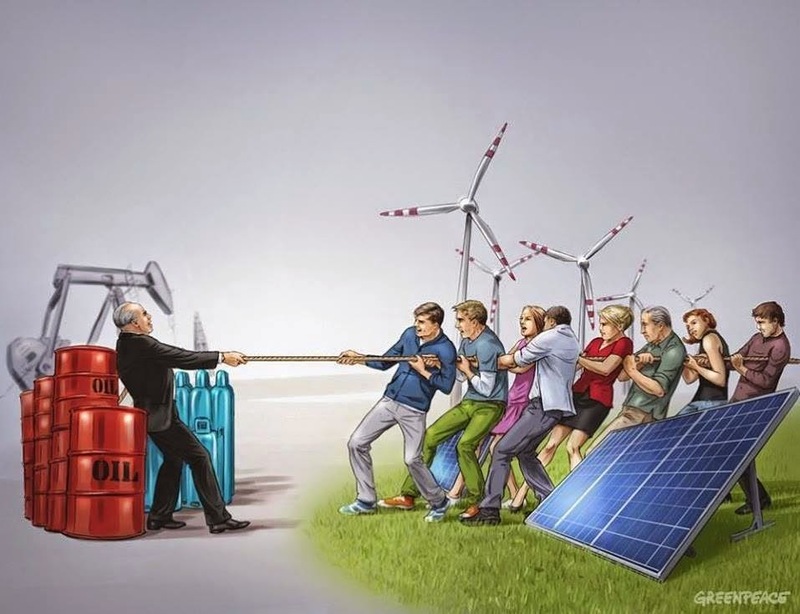 Due to diminishing supplies of fossil fuels they want to switch their domestic use to nuclear in order to extend their income from oil and natural gas sales. I am personally opposed to the use of nuclear power but once again find the US position on Iran's nuclear program to be one of total hypocrisy since Washington regularly promotes the use of nuclear all over the planet on behalf of corporate interests. All empires are evil; they are certainly undemocratic. Can the U.S. un-imperialize itself, or must it go the way of all empires? Collapse. This image is haunting. It comes from Jeju Island, South Korea where the Navy base fight continues after eight long years of daily struggle. 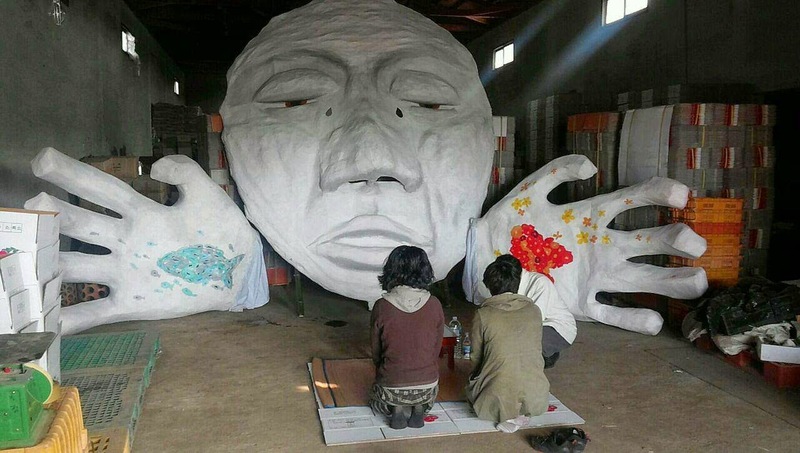 One Jeju activist writes, "Yeongdeun grandmother memorial ritual was held in several seashore villages in a rotating way, and Gangjeong village as one of the seashore village in Jeju also held it this year. The ritual now has the meaning to plant the seeds of life in the land and sea. Do you know what seeds the Gangjeong villagers planted? They planted the seeds of Red-feet crab who used to live in the Gangjeong Gureombi coast." The endangered red-feet crabs habitat along the rocky Gangjeong coastline has been blasted and cemented to build the docks for the Navy base that will port US aircraft carriers, nuclear submarines, and Aegis destroyers outfitted with so-called 'missile defense' systems. All of this US military mobilization will be pointed at China and Russia. I am deeply touched by a culture that prays and holds sacred even the simplest plants and creatures that surround us. This spiritual connection to all life indicates a depth of character of the Jeju people not often seen among Americans - except for the native people. Our capitalist ideology, and lifetime of mindwashing about the joys of the rat race system, teaches us that these 'non-human' parts of nature are just incidental to 'profit, progress and security'. Today in our Maine state legislature there is an effort underway to regulate open pit mining. The corporate extraction companies want to loosen regulations that restrict their ability to damage the environment. The mining companies want to increase profits and care little for the nature that gets destroyed during their operations. The Democrats that lead the Maine House of Representatives have been silent on this issue - I believe largely because the corporations have brought both mainstream political parties under the cover of the corporate tent. Over and over we hear the Democrats reading from the script about clean environment and/or peace but then when it gets down to the bottom line they often abandon the public in favor of the corporate agenda. Money or political power can't buy survival on our Mother Earth. We must protect the future generations and the only way to do that is by being connected to our relatives in the plant and animal world. The wind, the sun, the air, the water, and the earth are all our relations. We thank the people on Jeju Island for reminding us of these connections. In the whirling world of high finance and endless war for corporate interests one can easily forget what life is really all about. Beulah Walker, Volunteer Captain for the Detroit Water Brigade talks about the crisis in Detroit. She delivers water to Detroiters whose water has been shut off, and she does it with all her heart. I'm starting to get a handle on the Yemen story. Other than U.S. drone attacks in the country, that have killed many innocents, I had not paid alot of attention to politics in Yemen. But now all that has changed. I've turned down a couple of media interviews about Yemen because I felt I didn't know enough to make any comments. So I've been reading many articles and watching some videos so I can get my head around the issue. I have a world map on my office door which frequently helps me understand what is going on. Yemen (in brown lower center of map) borders Saudi Arabia. Even though a common border was delineated by the Taif Treaty in 1934 Saudi Arabia and Yemen have had continued conflict over the issue. (The Saudis took a bunch of land from Yemen around that time.) The possible oil reserves, civil war, and Saudi interventions in Yemeni politics have driven the conflict for much of the last century. 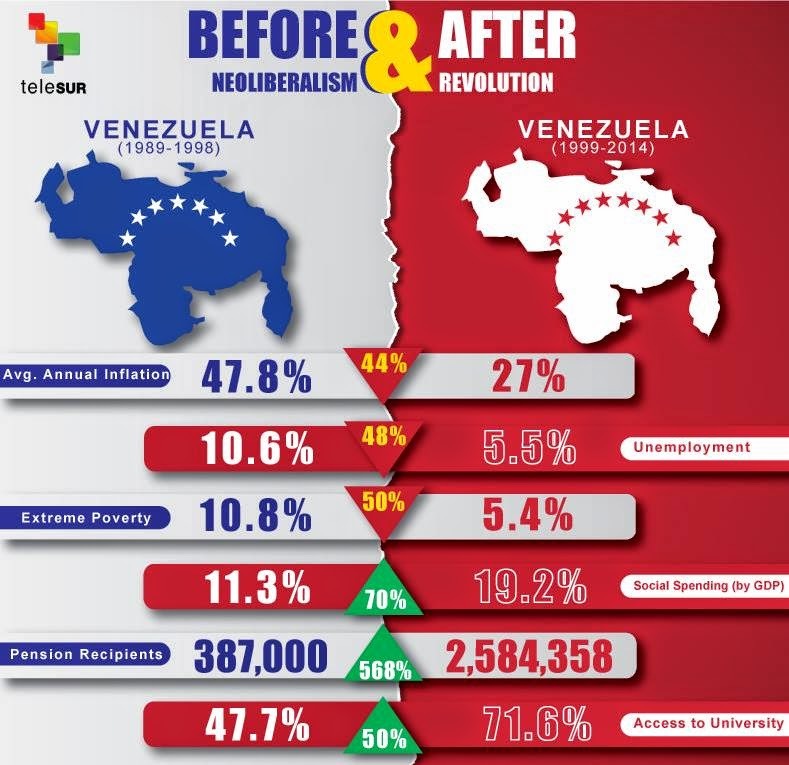 While many of the confrontations have been relatively sporadic, in the late 1990’s a number of building tensions came to a head, resulting in violent conflict. Saudi Arabia is a rabid Sunni fiefdom and they fund many of the fundamentalist terrorist sects (Wahhabism) currently waging war throughout the Middle East and Central Asia. In spite of that the US still kisses the Saudi monarchy's cheeks because they have oil. Iran, a Shia nation is the arch enemy of the Saudi kingdom. The division between Shia and Sunni dates back to the death of the Prophet Muhammad, and the question of who was to take over the leadership of the Muslim nation.To make it simple each side has their own influences with various countries in the region. The Saudis biggest allies are the other monarchies like the United Arab Emirates, Kuwait, Qatar, Oman and Bahrain. Israel and Egypt have also joined the Saudis in this current attack on Yemen. In Yemen there has been a struggle between Sunni (backed by Saudi Arabia and the US) and Shia (backed by Iran). 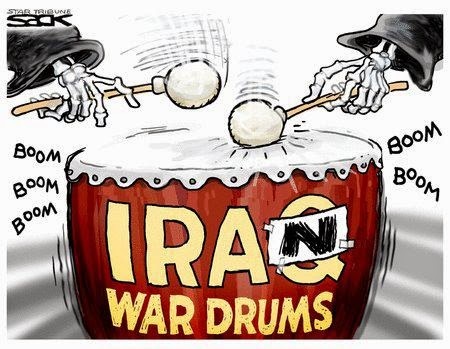 With Iraq increasingly leaning toward Iran, and Iran's ally Syria holding on for dear life against terrorists backed by Saudi Arabia and the U.S.-NATO war machine, the Saudi monarchy fears for their future - thus they are in attack mode. Inside Saudi Arabia are legions of poor people, many whom are Shia, that get no benefit from the oil fortune amassed by the head-choppin monarchy. They are presently in revolt as are people struggling for freedom against the monarchy in Bahrain where the US Navy Fifth Fleet is based. The Obama war team is helping the Saudis and their 'coalition' with intelligence and surveillance during this current bombing raid on Yemen. That means the US Space Command, and many of their military satellites orbiting the planet, are working overtime to identify targets and direct the attacks. The Saudis don't have that kind of space capability. So you can say this is a proxy war - another round of attacks against Iran that might just eventually land on Tehran's doorstep. On March 24 Sen. John McCain (R-AZ) made a speech on the Senate floor where he said, "Israelis will need to chart their own path of resistance. On the Iranian nuclear deal, they may have to go rogue." We know Israel wants Iran taken down. So does Saudi Arabia and their fellow Sunni monarchies. The US does as well but has to pretend it has 'exhausted all diplomatic measures' to create peace. It appears that more war and chaos in the region is now in the cards. 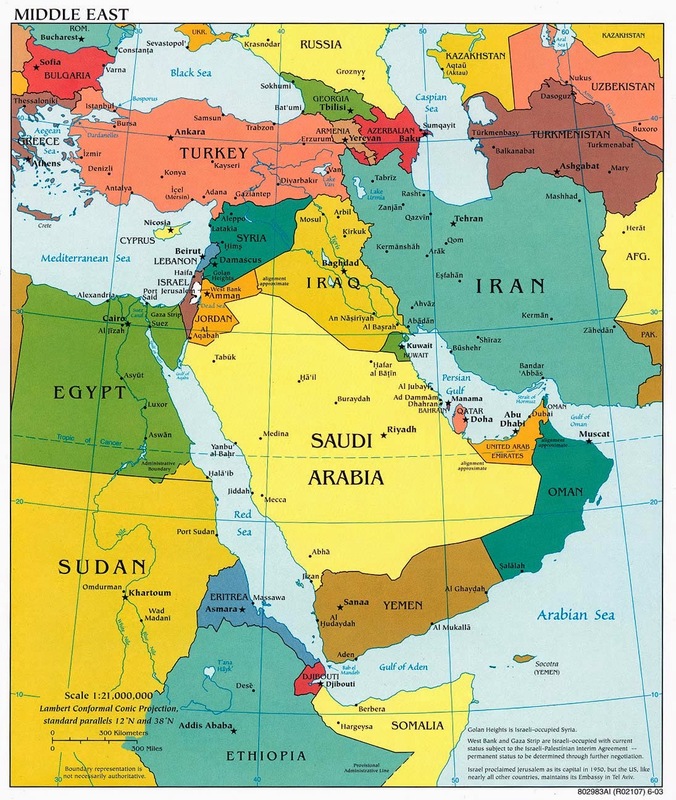 The take down list that included Afghanistan, Iraq, Libya and Syria is now being expanded to include Yemen, Iran, Ukraine, Russia, China, North Korea, Venezuela, and several African states. Keep your eyes on the bouncing ball. Amazingly the Obama administration still calls Yemen a "template" of success when it comes to its counterterrorism efforts. Closer to the truth is probably still another poorly thought out foreign policy adventure. And double standards abound – what is deemed legitimate for Yemen is denied in the case of Ukraine. Patrick Cockburn is an Irish journalist who has been a Middle East correspondent since 1979 for the Financial Times and, presently, The Independent. Among the most experienced commentators on Iraq, he has written four books on the country's recent history. Cockburn's latest book is The Jihadis Return: ISIS and the New Sunni Uprising. John Rachel writes a good article called Obama’s Neocons and Other Hawkish Lunatics. He covers many of the key players. 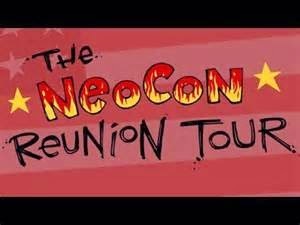 Neocons ain't just a Republican thing. They've successfully taken over both mainstream political parties in Washington. - Vice-President Joe Biden and Secretary of State John Kerry put a unique spin on the old GOOD COP/BAD COP routine. The Times Record recently reported that Meals on Wheels programs are being cut. Here in Maine education programs continue to be slashed and tuition continues to rise for already- beleaguered college students. The new Republican-controlled Senate wants to shut down the food stamp program. It’s as if the American people have become the enemy. We are told that the Pentagon- NSA-CIA budgets (nearly $1 trillion a year once all added up) are for our ‘security’. But real security — job security, health security, food security, education security, environmental protection— are all crumbling around us. Even BIW will see cutbacks as the Times Record reported on January 12. The Navy has determined that its shipbuilding budget is “unsustainable.” It can’t afford to cover the mounting costs of new aircraft carriers, nuclear submarines, and the Zumwalt destroyers being built at BIW. The latter costs more than double what the previous Aegis destroyer cost. The Navy’s solution for its budget crisis? Cut jobs, outsource to non-union workers, and, over time, likely move to get rid of the unions at shipyards like BIW. What is the Plan B for Bath? Who ever thought the Navy base in Brunswick would close and that thousands of jobs would be lost? How can our nation afford the expensive high-tech weapons systems that are costing the taxpayers an arm and a leg? How can we effectively deal with the coming ravages of climate change unless we immediately begin a transformation of our industrial policy from endless war to building rail systems, wind turbines, a solar society, and tidal power – all of which would help us in some degree deal with climate change? Where is our congressional delegation when we need it to advocate for a new sustainable technology direction? Collins, King, Pingree and Poliquin remain on bended knees begging for more Pentagon funding because military production is the only real federal jobs program left. They might talk a good game about environmental sustainability, but what are they doing to lead our state and the nation toward the kind of conversion that will be necessary if our children and grandchildren are to have any chance of decent lives? The Native Americans said that all decisions must be made based on how they impact the next seven generations. Sadly, our elected officials are thinking only about their next election! Studies have long revealed that our tax dollars create fewer jobs in military spending than in other fields. Building commuter rail systems at BIW would, in fact, nearly double the jobs. In addition, rail would get us out of our polluting cars and offer future generations a chance of survival. The corporate oligarchy that runs the show in Washington has plans for more war. Afghanistan, Iraq, Libya and Syria are a royal mess after our interventions there. Next on the target list for war are Ukraine, Iran, Russia, China and Venezuela. Imagine the tax dollars that will be wasted in those future futile battles. Our American economy has become addicted to war spending. What does it say about the soul of our nation that we must have endless war in order to provide workers with jobs so that they can feed their families? The American people are told that we are the exceptional nation — the exceptional people, but in fact people are really the same all over the world. They love their children, they love to laugh, and they love to share food with one another. By making us fear and hate one another, the corporations can persuade us to make war. In that way they can get control of natural resources and markets and make big money off the preparations for conflict. Empire with Marwan Bishara examines the rise and role of the new oligarchs and the decline of democracy in the United States and beyond. BILL TITLE: Calling on the President to provide Ukraine with military assistance to defend its sovereignty and territorial integrity. A special video about a woman in Donetsk in eastern Ukraine who is gardening to prepare for spring planting. In the midst of continued shelling by the US-NATO puppet regime in Kiev Zina keeps gardening because she wants to create something beautiful for her beloved community. 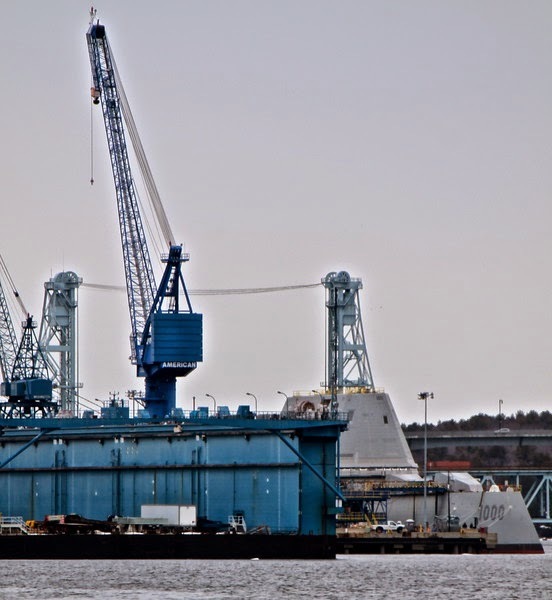 The Navy's new 'stealth' Zumwalt destroyer peeking out from Bath Iron Works. Reports are that the ship launching will be delayed due to major problems with the complicated and expensive technology on-board. This warship is costing more than twice as much as past destroyers at the shipyard. Suzanne and Mary Beth waiting for BIW workers to leave at noon last Saturday. The message of conversion of the shipyard to building rail, solar, wind and tidal power systems is a regular theme at our vigils. Sadly our elected officials from Maine, both Democrat and Republican, remain on their bended knees begging for more $$$$ for warships. They talk a good game about sustainability but are doing little to move us from endless war to actually having the ability to deal with climate change by dramatically changing our fossil fuel dependent way of life. These vigils serve as the conscience of the future generations. 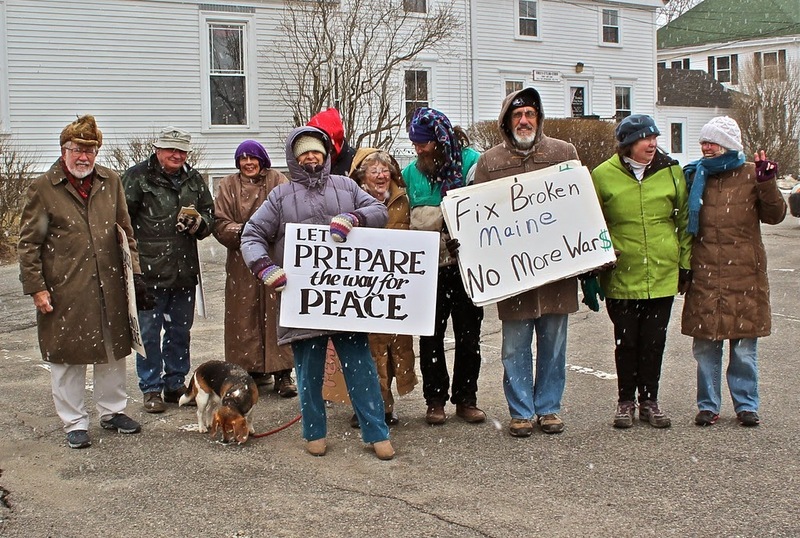 It was cold with blowing snow last Saturday as we again gathered at Bath Iron Works (BIW) for our series of Lenten peace vigils. Next Saturday will be the final Lenten vigil. We'll meet from 11:30 am - 12:30. 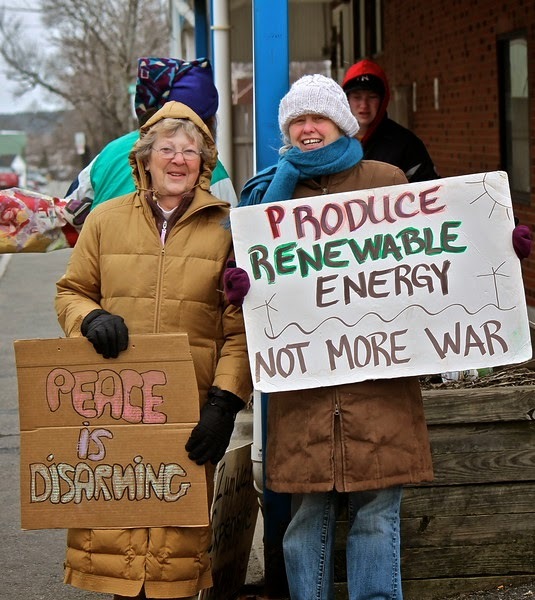 We must give special thanks to George & Maureen from the Smilin' Trees Disarmament Farm in Hope, Maine. For many years they have kept these BIW vigils going through Advent, Lent, Keep Space for Peace Week, and other special occasions including 'christenings'. I think our conversion of the shipyard message is seeping into the workforce and the community at large. At our larger than usual vigil two weeks ago at BIW we had one current and one previous shipyard worker in attendance. Another worker recently took a flyer from Maureen at one of the vigils and said to her, "You need to update this thing." So yes, some of the workers are paying attention and want even more information about our concerns and proposed solutions. These vigils are special times for me. Some folks like to talk to one another during such a vigil but I prefer to stand apart and try to establish eye contact with the people going by. I want to see where their heads are at. I want to see their reaction to my sign.... I tend to switch my sign regularly because I want to transmit many different thoughts. You really get a sense of the core of the nation when you stand outside a military production facility. You hear some nasty comments from some aggressive workers who want to defend their job. It's understandable, everyone wants to feel great pride in their work. But we also see some very thoughtful and kind workers who are pleasant, friendly, and appear to appreciate that we are outside the shipyard gates helping to foster a public discussion about what kind of product should be made inside the facility. How can we ever hope and dream about conversion of the military industrial complex unless and until the peace movement helps create a consistent, lively and dynamic discussion about such a concept? We've got to make some sparks fly. During the taped interview I also talked about some things that were left on the cutting room floor. One of them was the growing problem of space debris. There are now more than 25,000 tiny bits of junk whirling through space at 15,000 mph and this problem would be accelerated if any country was to attack another with an anti-satellite (ASAT) weapon. The International Space Station (ISS), which cost taxpayers $100 billion, has to frequently be moved to avoid space debris that is passing dangerously close. Some scientists have predicted that someday the ISS will be destroyed by flying space debris making the problem even worse. Any war in space would create so much space junk that no nation would ever be able to get a rocket off the planet again - space would become so polluted with debris that it would become an orbiting minefield. Thus the urgency to create a new treaty at the United Nations to ban all weapons in, and through, space. But sadly the US and Israel continue to block any progress on such a treaty essentially because the US wants to be the Master of Space. The US, China and Russia have all tested ASAT weapons in the past. Palestinian children on the radar - as video emerges showing masked Israeli soldiers raiding West Bank homes at night and interrogating young boys. The latest edition of This Issue features Paco Michelson and Hee Eun Park (Silver) from the Jeju Island International Solidarity Team. They visited Maine for a couple days near the start of their national tour to share the story about the Navy base struggle in Gangjeong village where US warships will be ported as part of the US ‘pivot’ to surround China. The 500-year old fishing and farming community on Jeju Island is now being destroyed to build the base. See www.SaveJejuNow.org for more information. 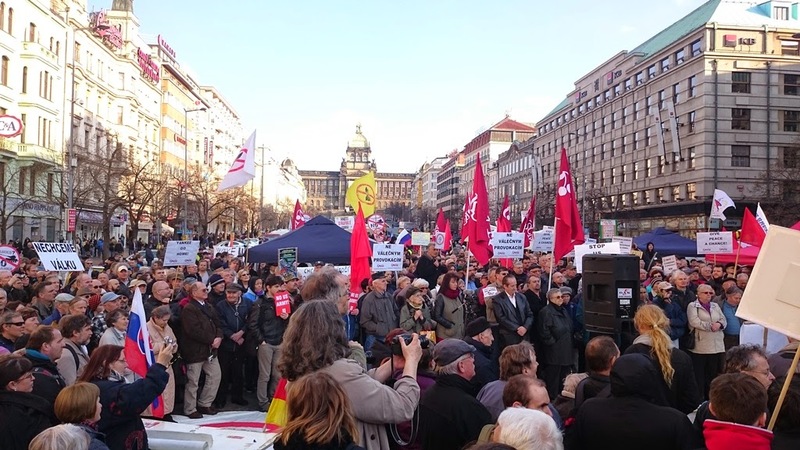 In Prague’s Wenceslas Square some 1,500 people demonstrated yesterday, Saturday 29th March, against Operation “Dragoon Ride” in which US army personnel and equipment are crossing Czech Republic territory starting today on the way to their German base. Speeches were given by several anti-war organisations, including the Communist Party and World without Wars and Violence all of which spoke highly critically of the government for the way that the decision to allow this procession has been made without going through parliament and knowing that 70% of the population is against the presence of foreign troops.